The Bahais worldwide celebrated the 200th anniversary of Baha’u’llah’s birth on the 21st and 22nd of October 2017. A notable feature of the last bicentenary was the number of tributes to Baha’u’llah and messages of congratulation issued by dignitaries and prominent members of society, such responses are customarily by any head of states in response to invitations they had received . The Bahais as usual having lost any acceptance in the society are elated by such responses, as if the whole purpose of bicentenary celebrations was to receive the responses. The UHJ was quick to commission both a film and a dedicated website for the occasion! A very notable outcome of this bicentenary celebration was the News media that revealed the relationship of Abbas Effendi with the then British empire. Many news channels broadcasted that Abdul Baha was saved by the British army, another media reported that he was saved by British secret service. The unprejudiced and sincere Bahais were shocked to hear from non Bahai News channel and they started questioning what a ‘Faith’ has to do with the secret service of Imperialistic Nation.This was the first time that non Iranian news channel and news broadcaster have thrown light on Bahai-Britain relationships. These Bahais were fearful to put their question to the Bahai Administration as they feared sanction. On 23 September 1918, in what is believed to be one of the last cavalry charges in modern military history, Indian soldiers carried out an attack that allowed British forces to capture Haifa from the Ottoman Empire.As they did so, they also ensured the safety of ‘Abdu’l-Bahá who was the son of Bahá’u’lláh, the founder of the Baha’i faith. 3-Bahaullah and Abdul Baha purchase lands in villages which was depopulated by Israelis ana later Shoghi effendi sold to Jewish National fund. On May 14, 1948, the Arab village of al-Nuqayb, where ‘Abdu’l-Bahá had owned land and grown grain, was depopulated in the fighting which broke out after the U.N. General Assembly’s adoption on November 29, 1947 of the Partition Plan for Palestine. Al-Nuqayb (transliterated as Nughayb in the Bahá’í orthography) is mentioned in Lady Blomfield’s The Chosen Highway, in the sectioned titled Bahá’í Villages. Abdul Baha bought from time to time some land in various villages. Asfiya and Daliya, near Haifa–these two properties He bestowed upon Diya’u’llah and Badi’u’llah, the two younger half-brothers, at the request of Bahá’u’lláh. Land was also acquired in the villages of Samrih, Nughayb, and ‘Adasiyyih, situated near the Jordan. In his book All That Remains: The Palestinian Villages Occupied and Depopulated by Israel in 1948, the historian Walid Khalidi details the history of many of these Palestinian villages and how they were depopulated. For example, he notes that in the 1880s most of the village land of al-Nuqayb was purchased by Bahá’u’lláh, with the villagers continuing to farm as tenant farmers. In the 1920s, this land was sold by Shoghi Effendi to the Jewish National Fund. 4- Abdul Baha supplied The corn produced by in these farms to British army. Bahá’í Villages in The Chosen Highway chronicles in some detail how ‘Abdu’l-Bahá used the grain he had grown in these villages to supply the British Army during World War I. We learned that when the British marched into Haifa there was some difficulty about the commissariat. The officer in command went to consult the Master. “I have corn,” was the reply. “But for the army?” said the astonished soldier. “I have corn for the British Army,” said ‘Abdu’l-Bahá. Sir ‘Abbas Effendi ‘Abdu’l Baha had travelled extensively in Europe and America to expound his doctrines, and on the 4th December, 1919, was created by King George V a K.B.E. for valuable services rendered to the British Government in the early days of the Occupation. On April 27, 1920, ‘Abdu’l-Bahá was ceremonially knighted, an event which was prominently reported in the Bahá’í periodical Star of the West. THE following beautiful description of this event was written by Dr. Zia M. Bagdadi who was at that time in Haifa: “Among the kings and governments of the world who have become convinced that Abdul Bahá was the well-wisher and the lover of mankind are King George and his government. The King sent a medal to Abdul Bahá with the title, “Sir”, thus making him a member of his household. On the 27th of April, 1920, the Governor and high officials of Haifa, Palestine presented in a beautiful garden a most wonderful celebration for the knighting of Abdul Baha. Bahai pilgrims from Persia, America and all parts of the world were present. Mohammedan, Christian, Jewish leaders, clergymen, notables and local officials from Haifa, Acca and other towns attended. A tent was pitched in the center of the garden. English troops stood on both sides, from the gate of the garden to the center where Abdul Bahá was seated. The military music added wonderful melody to the rustling leaves of the beautiful trees. The breezes of the spring on that sunny afternoon imparted a remarkable vigor to the physical body just as the presence of Abdul Baha strengthened the souls. The Governor stood behind Abdul Bahá and, after a short speech, interpreted by Mr. Wadie Bistani, presented the medal. Then Abdul Baha, rising from his seat, gave a brief talk and a prayer for the British government. 7-Abdul Baha hosted a member of Rothschilds who were leading financier of Zionist movement in occupation of Palestine. On February 23, 1914, at the eve of World War I, ‘Abdu’l-Bahá had hosted Baron Edmond James de Rothschild, a member of the Rothschild banking family who was a leading advocate and financier of the Zionist movement, during one of his early trips to Palestine. At the time of ‘Abdu’l-Bahá ‘s death, Shoghi Effendi was matriculated at Balliol College. In a letter to Marzieh Gail, Shoghi Effendi outlined his educational ambitions at Balliol College, specifically to study with eminent professors and Orientalists, noting alumni who were all Imperialists. After ‘Abdu’l-Bahá ‘s death, Shoghi Effendi would continue to have close relations with the leading political administrators and prominent Zionist leaders. For example, on January 24, 1922, Shoghi Effendi received a letter from Herbert Samuel, the British High Commissioner for Palestine. The receipt of the letter is mentioned in Amatu’l-Bahá Rúhíyyih Khánum’s The Priceless Pearl. As High Commissioner, Herbert Samuel was the first Jew to govern the historic land of Israel in 2,000 years, and his appointment was regarded by the Muslim-Christian Associations as the “first step in formation of Zionist national home in the midst of Arab people.” Herbert Samuel welcomed the arrival of Jewish settlers under the auspices of the Palestine Jewish Colonization Association and recognised Hebrew as one of the three official languages of the Mandate territory. I have to acknowledge receipt of your letter of Jan. 16., and to thank you for the kind expression it contains. It would be unfortunate if the ever to be lamented death of Sir ‘Abdu’l-Bahá were to interfere with the completion of your Oxford career, and I hope that may not be the case. I am much interested to learn of the measures that have been taken to provide for the stable organization of the Bahá’í Movement. Should you be at any time in Jerusalem in would be a pleasure to me to see you here. The Baha’i Administration is going to have a second centenary celebration next year and that is of Bab, we should be prepared to receive more unexplained Bahai relations with different Nations which will shake the belief of many more Baha’is all over the world. Al-Nuqayb (transliterated as Nughayb in the Bahá’í orthography) is mentioned in Lady Blomfield‘s The Chosen Highway, in the sectioned titled Bahá’í Villages. The Master bought from time to time some land in various villages. Asfiya and Daliya, near Haifa–these two properties He bestowed upon Diya’u’llah and Badi’u’llah, the two younger half-brothers, at the request of Bahá’u’lláh. After ‘Abdu’l-Bahá ‘s death, Shoghi Effendi would continue to have close relations with the leading political administrators and prominent Zionist leaders. For example, on January 24, 1922, Shoghi Effendi received a letter from Herbert Samuel, the British High Commissioner for Palestine. The receipt of the letter is mentioned in Amatu’l-Bahá Rúhíyyih Khánum‘s The Priceless Pearl. As High Commissioner, Herbert Samuel was the first Jew to govern the historic land of Israel in 2,000 years, and his appointment was regarded by the Muslim-Christian Associations as the “first step in formation of Zionist national home in the midst of Arab people.” Herbert Samuel welcomed the arrival of Jewish settlers under the auspices of the Palestine Jewish Colonization Association and recognised Hebrew as one of the three official languages of the Mandate territory. I am putting the link here because I found it quite interesting. 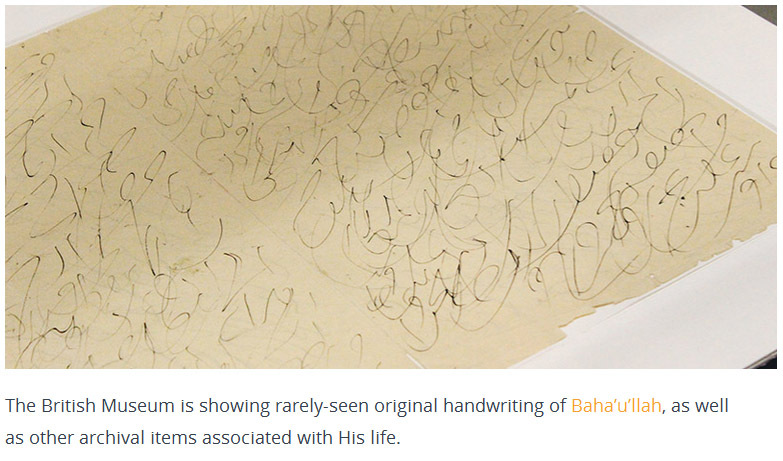 This web site, rather, this blog put up quick posts to highlight the contradictions in the texts and behaviour of the Bahais, their Faith and more importantly, their leadership. I appeal to all Bahais in the name of their principle of “Independent Investigation of Truth” that they should set aside their prejudices and read this web site. Please respond maturely and with an open mind. It is said history repeats but in Baha’i faith it repeats too often for the more or less same purpose. A short time ago we found that the Baha’i administration asking the NSA of different countries to propagate the matter of fake Ayatollah Mr. Tehrani risking his life in Iran now a similar type of incidence has emerged in Yemen where the UHJ is trying to risk the life of Mr. Bin Hydara by asking hostile countries like Netherland and United Kingdom to appeal to Yemeni government for release Mr. Hydara. During the process of great game, the British deep state surrounded Iran from the south and made it a half-colony, all the while robbing its natural resources and securing concessions in all industries. The discovery of oil in Iran in 1908 became the key factor in the 20th century Iran policy of the British deep state, which was marked by military campaigns, social-economic projects, political interventions and political coups. In 1913, the British government secured a contract that practically made the entirety of Iranian oil British property. Only six years later, it imposed an agreement, which gave it control of the Iranian army and treasury. Although Iran had declared its neutrality during WWI, the British invaded southern Iran. Capturing the region up to Kazvin, and gaining control of areas under the rule of the Qajar Dynasty, they became the sole power in the country and once again employed the method of causing famine to weaken it, all the while blocking the aid efforts of countries like the Ottoman Empire and the USA. As the disaster was unfolding, the Bahai’s, which the British deep state was using as killing machine, unleashed a fresh wave of terror in 1916. Although Iran declared its neutrality once again during WWII, the troops of Great Britain didn’t refrain from invading a large part of Iran and left in its wake a country struggling with poverty and starvation. Even though the country was in the grips of famine and poverty, it was actually home to one of the world’s largest oil reserves. The reason behind this surprising dilemma was the British Anglo-Persian Oil Company (AIOC), as it had been controlling the country’s oil since the beginning of the century. Known as BP today, AIOC managed to increase its annual profit in 1950 to 200 million pounds, while Iran was making only 16 million pounds in profits. Since 1908, Britain had been considering Iranian oil its own property and was fiercely protective of it. It had been using the country’s oil to meet its energy needs for over half a century, while the Iranian people were struggling with hunger and death. Mohammad Mosaddegh, who was elected as Prime Minister with massive popular support in May 1951, started the National Iranian Oil Company and transferred the entire oil industry, which was under British control, to its Iranian counterpart. The British immediately responded with a series of economic and political sanctions against Mosaddegh for landing a massive blow to their biggest source of income. Mohammad Reza Shah also began to pressure the Mosaddegh government. However, when these efforts failed, a military coup was planned to overthrow Mosaddegh. Upon the request of the British, US President Eisenhower instructed the CIA to organize a coup. After having organized many anti-government rallies throughout the summer of 1953 by means of the month-long ‘Operation Ajax’, the CIA carried out the coup with General Fazlollah Zahedi as the coup’s leader. The great game that the British deep state started in early 1800 continues even today for Iran, Turkey, the Middle East not to mention the Islamic geography in general. The method is invariably the same: Inciting conflicts by means of sectarian, ethnical, racial differences so that in the end Muslims begin fighting each other. The only thing that changes are the names and faces; in the past, the Bahais were used. Today, it is MI6 Shias, MI6 Sunnis and Salafists. However, today the British deep state is completely exposed. Soon, Muslims will put and end to their separation and disagreements and join their forces around the unifying spirit of the Qur’an. When this happens, the great game of the British deep state will come to a definitive end and not only the Middle East but the entire world – including the British people – will then find peace and security. [i] Şahbazi. Abdullah, ‘Manekci Hateria and Bahayigeri-e Avvaliye’, 29 Bahman 1388/18 February 2010 , ‘Bahayism’ p.22. How do you say that Baha’ism was a plot of the Britain? Two British rite Masons are behind the Masonic support for the creation of Bahaism from the mid Baghdad period: Manekji Limji Hataria and Mirza Malkom Khan. They made contact with Baha’u’llah in Baghdad during the mid-1850s and met with him personally. Only a few short years afterwards Baha’u’llah openly made his claim and relegated Subh-i-Azal to the margins and had all the prominent dissenters murdered. Subh-i-Azal was not willing to play any games with Masons and British agents such as Manekji and Malkom Khan, so the British rite Masons split up Babism and supported Mirza Husayn Ali Nuri Baha’u’llah to make up his own religion which they have supported ever since. The association of Manekji and Malkom Khan with Baha’u’llah is openly admitted by Baha’i sources. The Covenant of the Baha’i Faith is dead, may it be buried forever! Shoghi Effendi is known to Baha’is around the world as the Guardian of their Faith. But with a Guardian like him, the Baha’i Faith never needed enemies to destroy it! • Had expelled from the Baha’i Community, often for trivial reasons, EVERY ONE OF HIS BROTHERS, SISTERS, AND MALE AND FEMALE COUSINS! None of them were spared his holy wrath. And every single issue cited above was either a discrediting or disobedience of some Baha’i scripture or is something that was totally unnecessary and made the obedience to Baha’i scripture impossible. Also, if Abdu’l-Baha really believed in the equality of men and women, he would not have appointed his 21 year old grandSON his immediate successor, but would have instead appointed his eldest DAUGHTER. But she, even as the mother of Shoghi Effendi, is merely a footnote in Baha’i history. So Abdu’l-Baha was himself a hypocrite! Did you know that in the early years of his Guardianship, Shoghi Effendi tended to take long vacations in the Swiss Alps to get away from his duties and his relatives had to beg him to return? As long as the Greatest Holy Leaf, Abdu’l-Baha’s sister, was still alive, she could keep him in check, but after she died, he became a tyrant to his relatives, treating them like mere servants and punishing them whenever they dared to question his orders and demands. This is what happens when you give a man so much power that he thinks he is like God! Shoghi Effendi was a megalomanic that official Baha’i propaganda has tried to whitewash with false narratives decades after the fact, but the truth speaks for itself and cannot be excused. The sacred and youthful branch, the Guardian of the Cause of God, as well as the Universal House of Justice, to be universally elected and established, are both under the care and protection of the Abhá Beauty, under the shelter and unerring guidance of the Exalted One (may my life be offered up for them both). Read again the above the circumstances of the Guardian’s death. I guess the issue of “care and protection” for him was indeed a lie!